In 1988, a small group of wives of PGA TOUR players created a non-profit organization to support charities in communities they visited on the TOUR. Twenty-five years later, the PGA TOUR Wives Association has raised over $5 million and engaged in hundreds of charitable projects that have impacted the lives of thousands of children and families in need. This stunning 25th Anniversary "family album," compiled by members of the PGA TOUR Wives Association, captures the Association's quarter century of charitable work and, through hundreds of heartwarming stories and family photographs, offers readers a rare glimpse into the lives of PGA TOUR families — both on and off the course. Beyond the Fairways and Greens also features 134 treasured recipes submitted by the families of generations of professional golfers, like Arnold Palmer, Jack Nicklaus, Gary Player, Phil Mickelson, Jim Furyk, Luke Donald, Zach Johnson, Justin Rose, Rickie Fowler, and many others. The PGA TOUR wives who created this book hope readers enjoy their families' stories and recipes as much as they have enjoyed sharing them. As they will tell you, life on the road is unique; but a life on the TOUR is priceless. 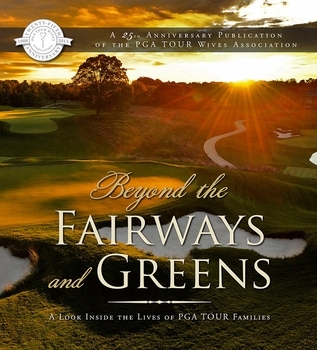 By purchasing a copy of this book, you will be helping the PGA TOUR Wives continue their mission of helping children and families across America for generations to come.